Yekaterinburg (from 1924 to 1991 - Sverdlovsk) is a major city in the central part of Russia, the administrative center of Sverdlovsk Oblast and Russia's fourth largest city by population (after Moscow, Saint Petersburg and Novosibirsk). The population of the city is 1 350 100. Yekaterinburg was founded in 1723. It is an important centre for industry, transport, finance, science and culture. The city features a humid continental climate with the sharp change in the weather. The Ural Mountains, in spite of their small height, block the way to air masses, coming from west, from European Russia. As a result the Middle Ural turns out to be openned to the incursion of cold Arctic air, but at the same time warm air masses from Caspian Sea region and the Middle Asia can freely penetrate here. So sharp temperature fluctuation is typical for Yekaterinburg. One could see the unique natural phenomenon - winter thunderstorm - in January 2002. The average temperature of January is -13,6 °C. The lowest temperature ever recorded was -46,7 °C on 31 December 1978. The average temperature of July is +18,5 °C. The highest temperature ever recorded was+38,8 °C on 1 July 1911. Yekaterinburg is the administrative, cultural, educational center of the Urals Federal District. The headquarters of OSK "Tsentr", Presidium of the Ural branch of the Academy of Science, 35 territorial federal government bodies are situated here. 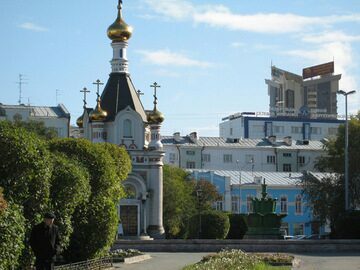 The city is sometimes called "the capital of Ural". Nowadays there are 18 state universities, 14 private ones and 1 military university functioning in Yekaterinburg.